Organic red peppers slow-roasted until silkily sweet and lightly charred, whizzed up with buttery chickpeas, nutty tahini and cold-pressed olive oil. We finish it off with a hint of zesty lemon, garlic, and fragrant ginger and cumin. The result is fresh, mellow and very moreish. 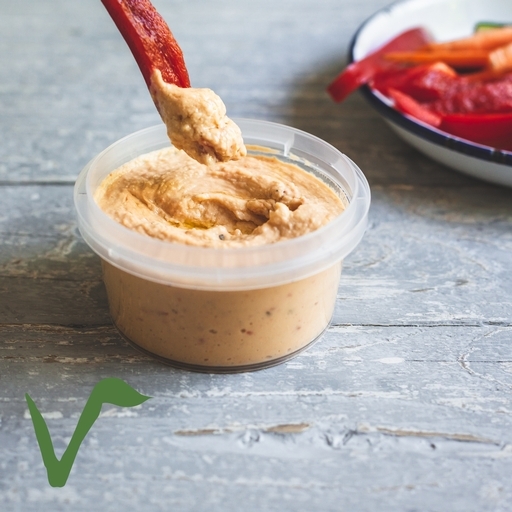 Red pepper hummus makes a lovely addition to summer picnics – enjoy simply alongside crudités, warm pittas or a crisp salad. Chickpeas (61.5%), filtered water*, extra virgin olive oil, red peppers (7.7%), lemon juice, tahini (sesame), garlic purée (garlic, citric acid*), salt*, black pepper, cumin, ginger.